Here at The Rod Glove, our number one priority is making the fishing experience as easy and hassle-free for our customers as possible. That means we produce a product that is both highly functional and easy to use. In the end, the beauty of the Rod Glove is its simplicity – once it’s on your fishing rod, you can forget about it, and enjoy the day. We know, however, that our clients’ Rod Glove experience starts long before they first take their new Rod Gloves on a fishing trip. It starts with our smart design, with our team, and with our customer service. And, more often than not these days, it starts with our website. We wanted the ease of use and functionality inherent in our product to extend to our website, but it was becoming clear that our old site wasn’t making the grade anymore. So, we decided it was time for an overhaul. The new Rod Glove website was built to make it easy for our clients, from leisure fishermen, to pros, to retailers and dealers, to find what they're looking for. It’s super easy to navigate. Everything you need is just a click away, whether you’re looking to buy a new Rod Glove, find out what other fishermen are saying about our brand, watch our latest pro video, or anything in between. So take a look around – we think you’ll like our new look. 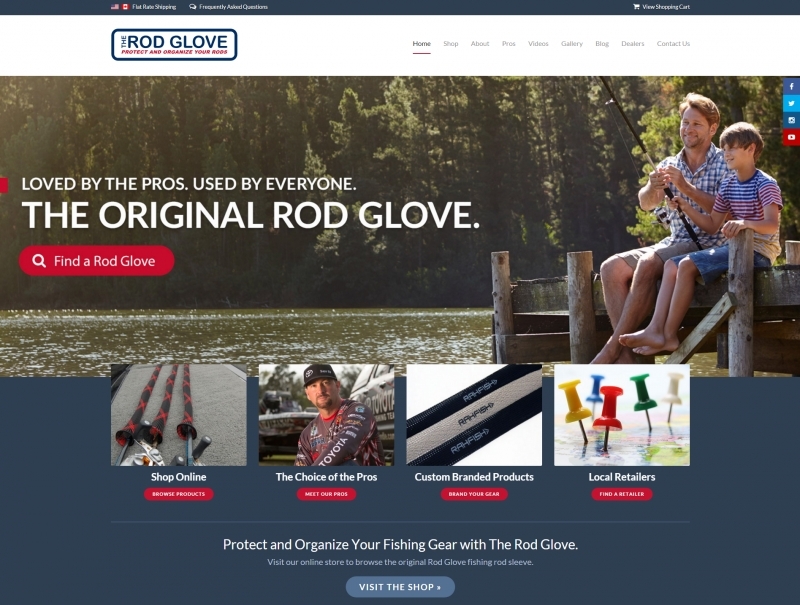 You can learn all about The Rod Glove by checking out our About page, browse the Rod Glove categories in our shop, or meet our pro fishermen on our Pros page. And of course, feel free to get in touch with our team anytime with questions, feedback and comments about our new site, and our product. I get asked "what's one thing that makes my job and organizations of the boat simpler?" Well, I can sum it up in three words THE ROD GLOVE. It doesn't matter if you are in the front or the back of the boat or even a bank fisherman, these are a MUST for any angler by far.